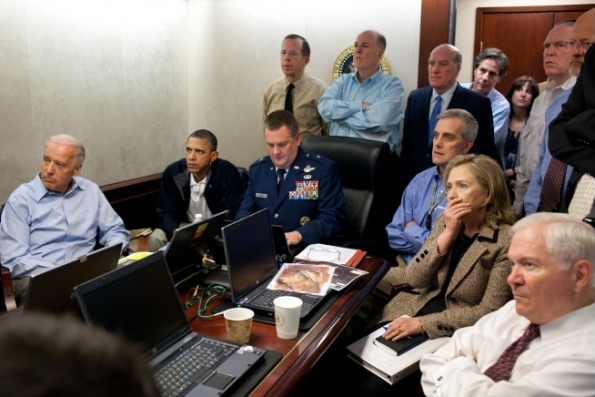 U.S. President Barack Obama along with members of the national security team receive an update on the mission against Osama bin Laden in the Situation Room of the White House. Official White House Photo by Pete Souza. It has always been a mystery as to how Osama bin Laden was killed! But in the first revelation of the top secret American commando operation against Osama bin Laden, it has now been stated by a White House intern that the terror mastermind was indeed shot in the head and in the chest. “In the White House I saw a number of photos of the killing. To be frank, some looked rather dreadful with the man shot in the head and in the chest,” says the 25-year-old Chinese Gong Xiaosi, who was then on a 10-day internship in the White House. Gong told China Daily newspaper that she was inside the White House during the period bin Laden was killed by the U.S. Navy SEAL in the surprise mid-night raid at his Abbottabad hide-out in Pakistan in May. As the media waited as to why U.S. President Barack Obama had called a sudden press conference, Gong remained excited to be in the State Department to witness the account as it unfolded. “The government officials and politicians had a lot of discussions about how to set the tone, and I was so lucky to be in the State Department to witness this,” Gong said. It was only three days later that Obama talked with “60 Minutes” correspondent Steve Kroft in the Roosevelt Room of the White House. Until then, ‘Osama bin Laden Dead’ was the biggest news all over the world and also the biggest flop for the media internationally. Not a single newspaper, magazine, TV channel, or a source could publish or show or talk about the final moments of the al Qaeda chief. I had watched online the White House officials’ briefing to the press thereafter when to an extent they were subjected to some quite uncomfortable questions on the killing. And as a world citizen, who heard about Osama bin Laden’s death, I had demanded that the U.S. must release the related photos and the proof of bin Laden’s burial. A Pakistani military official, who took photographs inside the house where bin Laden was killed, meanwhile sold some pictures to Reuters news agency. Gong told the China Daily that “when dealing with the issue, the politicians sometimes neglected the feelings of people from other countries, especially from Pakistan.” The newspaper said that of the 26 interns selected worldwide to work in the White House, one was from Pakistan and was quite embarrassed when US officials kept talking about how dangerous and terrible Pakistan was. “If the Pakistani intern were an extreme person, she would probably harbour hatred in her heart,” Gong was quoted. Gong had applied for the internship in December 2010 when the US government promised to open its gates to 26 successful females from around the globe in May.